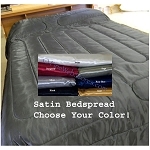 Solid Color Quick Ship Daybed Cover Set In 17 Colors And Patterns. The modern daybed is quite functional with frames that are made of a wooden or metal. The frame is combined with a link spring system that will accommodate a standard twin size mattress. Less expensive metal daybed frames are made from metal tubing following a number of different designs. Many modern daybeds are designed with enough space to store a separate trundle bed underneath. The frames can range from the simple to others that are quite ornate. Daybeds can be found in a wide range of prices to fit and budget and room decor. The basic purpose of a daybed is to provide a place to lounge or to sleep. With historical links to the ancient Romans and Greeks, the daybed has endured though designs and materials have changed over the centuries. From the Victorian Age to the present day, the daybed has remained an essential piece of furniture. Daybeds are a great way to accommodate overnight guests. The addition of a hideaway trundle bed provides even more sleeping space without taking up more room. Throughout the history of the daybed, any seating surface that can be easily converted to a bed can be defined as a daybed. Every ancient culture had its own version of the daybed. Predating the modern sofa and couch, daybeds have roots as a place to relax. The ancient Greeks utilized a kind of daybed called a kline. A kline would be placed in areas of the home where guests would often congregate, providing a comfortable place for leisure and socializing. In many areas of the world, including regions of the Mediterranean, wood was, and can still be a scarce commodity. Ancient daybeds were quite often made of marble of other type of stone. Cloth pillows and cushions were used to create a more comfortable seating surface. Many modern pieces of furniture have their roots in the concept of the daybed. The familiar chaise lounge is patterned from the daybed. Dr. Sigmund Freud had his patients relax on the proverbial couch while he psychoanalyzed them. The couch used by Dr, Freud and his peers was not a couch is the classic sense, but in fact was a daybed. Otherwise referred to as a chaise, the daybeds of Freuds day were different from what we consider a modern daybed to be. Not a quite bed and not quite a couch, it was a comfortable place for the patient to lie back and relax. With something called the cure chair, the medical profession adapted the concept of a daybed into a restful place for patients to convalesce during a long illness. As an alternative to the traditional flat bed, the cure chair placed the patient in an upright position. Patients with pulmonary diseases like tuberculosis and pneumonia were thought to do better than if they were confined to a traditional flat bed. The cure chair was a full length chaise lounge that was adjustable much like a hospital bed. The adjustable back afforded the patient with the chance to recline or sit up. The cure chair was relatively portable compared to heavy iron hospital beds. Portability gave patients the opportunity to enjoy some fresh air and sunshine far removed fro the confining atmosphere of a tuberculosis ward. Daybeds have a history of portability serving another very utilitarian purpose. From the days of the Napoleonic Wars, many officers were issued a chaise type chair that was easily convertible to a cot for sleeping. A precursor of the modern chaise lounge, the field chairs were lightweight, portable and provided officers a place to relax and to sleep. The Colonial period saw daybeds of that featured a backless design. This design was wide enough to be used comfortably as a bed. Hideaway trundle beds are a very popular addition to the modern daybed. Trundle beds are designed to fit neatly under a daybed and can easily be pulled out to provide extra sleeping space. There are popup trundle beds that are designed to pop up equal to the height of the day bed. Put the trundle and the daybed together and you have a sleeping are that is as large as a traditional king size bed.